Years ago, we are the classic vespa lover. The more old the vespa the more we love them. And we still do. To have the sidecar attached to the vespa is a very interesting idea. It makes the vespa more beautiful yet functional at the same time. When we first tried the vespa with sidecar, we found out that every time we do the breaking on the vespa the sidecar will push the vespa to the side also while decreasing the speed. Other experience was when the vespa with sidecar was cruising between 30-40kph, the handle bar was shaking because the wheel condition was not balance (one at the front and two at the back). We were challenged to design the good and comfortable sidecar. 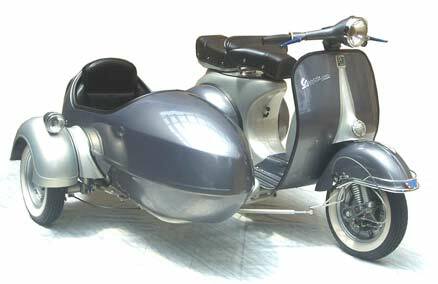 We were interested to combine the art and comfortable design to enhance the classical vespa. With several trials, we finally get the good design that overcome the above problems and also suit the customer taste. We started the production in 2002. We have sold many units worldwide ever since. We strive to keep our customers satisfy, and offer the best performance and value in the business. Our satisfaction from the business extends far beyond the monetary: We thoroughly enjoy producing these ‘blend of comfort and art’ creations for our appreciative customers and we have been gratified to receive orders from Germany, United Kingdom, Portugal, Italy, Austria, Belgium, France & other countries as well as from all over the United States. Just contact us for price quotation and custom design, we’ll be right back to you with the answers and you’ll be cruising on vespa with sidecar very soon.